Delight in an old-fashioned holiday in historic downtown Nevada City and experience the romance of Christmas past during Nevada City’s renowned Victorian Christmas. 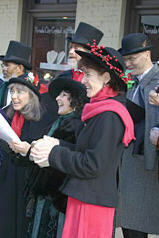 The city comes alive as strolling carolers, musicians, and costumed vendors fill the streets. Nevada City’s many unique specialty stores as well as creative street vendors will be open for your holiday shopping. Enjoy hot cider, hot spiced wine, roasted chestnuts and food from local restaurants or street vendors. A favorite uniquely Nevada City favorite for locals and tourists alike! Come join us! Also visit Cornish Christmas in Grass Valley Fridays November 27 – December 19, 6 – 9pm.